Dark dusty violet color. Fruity aromas and flavors of boysenberry jam, eucalyptus, fertile earth, and blueberry pie with a velvety, crisp, fruity medium-to-full body and a warming, medium-length finish revealing nuances of chocolate covered blackberries, toasty griddle cakes, mountmorency cherry, and salted blood orange with medium tannins and moderate oak flavor. A juicy high-elevation malbec that will hit the spot. Bottom Line: A juicy high-elevation malbec that will hit the spot. 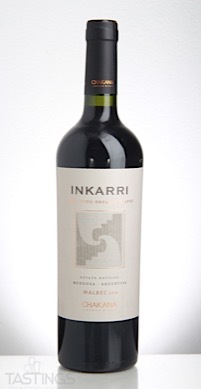 Inkarri 2016 Estate Bottled, Malbec, Luján de Cuyo rating was calculated by tastings.com to be 91 points out of 100 on 2/2/2018. Please note that MSRP may have changed since the date of our review.